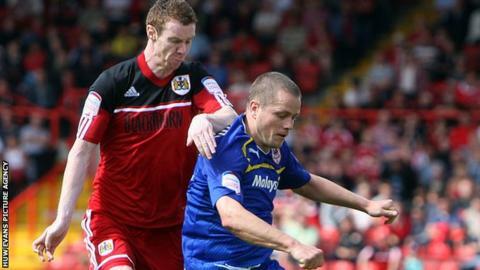 Bristol City briefly climbed to the summit of the Championship table by ending Cardiff City's unbeaten start. Stephen Pearson and Martyn Woolford gave the hosts a deserved half-time lead after a dominant first half. Joe Mason's header gave Cardiff hope, but a slick counter attack saw Woolford restore the two-goal advantage. Cardiff again replied through Heidar Helguson only for debutant Sam Baldock to finally put the result beyond doubt with three minutes remaining. Bristol City's final two goals epitomised the difference between the two sides as they broke with pace and purpose to rip open Cardiff's defence. The visitors, who offered virtually nothing in the first half of a match which kicked off before the day's other Championship fixtures, sorely missed Craig Bellamy's penetration as the starting front three of Helguson, debutant Tommy Smith and Don Cowie failed to make any impact. Mason's introduction and a change of formation at half-time transformed Cardiff, giving manager Malky Mackay food for thought as he considers how best to mould a new-look side. But there were plenty of positives for Robins manager Derek McInnes as his side scored four goals for a successive Championship match to secure only a second win over Cardiff in the last 10 league meetings. Bristol City's pressure gradually grew as the first half wore on, with the pacey Albert Adomah exploiting the space vacated by Cardiff's advancing full-backs. Adomah wasted the first clear chance when he shot wide and then Ryan Taylor's header found the side netting. But the opener was a complete gift as Aron Gunnarsson's misplaced pass deep in his own half exposed the Cardiff defence. Adomah penetrated before his cut-back found Pearson, who arced the ball into the bottom-left corner from the just inside the penalty area. The outstanding Jonathan Stead was the next architect as more sloppy Cardiff play led to the home side's second on the stroke of half-time. The rangy striker used his frame to protect the ball and the on-rushing Woolford passed the ball past Cardiff goalkeeper David Marshall. Mackay responded to his side's lacklustre show by replacing Gunnarsson with Mason, and the change bore immediate dividends as the substitute found space in a crowded six-yard box to head home after Peter Whittingham's corner. The Bluebirds, back in their more familiar blue shirts, immediately found more purpose and energy, with Mason's direct running finally testing the home defenders. Whittingham, whose long-range efforts were all Cardiff managed in the first half, went close with another shot after Smith had broken through. But the Robins responded to the warning signs with a textbook counter attack to score their third. The Cardiff defence, which included debutant Matthew Connolly in Ben Turner's absence with injury, was ripped apart down the middle and Woolford had a simple task to score after Baldock's shot rebounded off the post. Helguson, scoring his first league goal since joining Cardiff from Queens Park Rangers, ensured a tense final minutes when he slotted through Tom Heaton's legs. But the home nerves were calmed five minutes later when Baldock, a 64th-minute substitute, ensured a scoring debut when he beat Marshall after being played through the heart of the static Cardiff defence. "We are getting goals from the middle of the park, which we didn't do last season and now have some great options up front. "With Sam [Baldock] and Steve [Davies] on board, we have a lot of different strikers, who pose threats in various ways. All the clubs I have been at, who were successful, had good strength in depth when it came to strikers. "It is very early days, but after last season I'm delighted to be challenging at the right end of the table even at this stage of the campaign." "Without taking anything away from Bristol's performance, we conceded some bad goals. "We gave the ball away in poor areas, which is not like us. We started the season defensively strong, but today we didn't keep to that standard. "If you gift possession to good teams they are going to punish you. We will look at the DVD and identify where we could have done a lot better."